Rye in Sussex, is one of those pretty little market towns that time seems to have passed by. 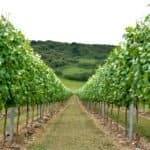 Nestled between the green rolling hills of the South Downs and the English Channel Rye is a Cinque Port town in Sussex and one of the best-preserved medieval towns in England. 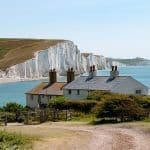 If you’re visiting Sussex the higgledy-piggledy half-timbered houses and muddle of steep cobbled lanes, beach walks and ancient inns make Rye town the perfect place for a Sussex weekend break. 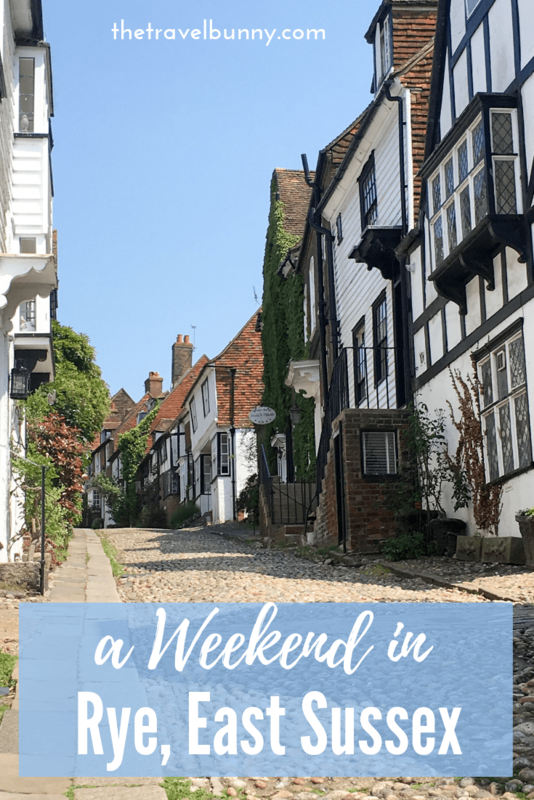 Read on for some of my favourite things to do in Rye. May include compensated links – read more info in my disclaimer and disclosure. When you visit Rye you should start your weekend by wandering through it’s quaint little lanes. With names like Watchbell Lane and Wish Street you can’t fail to be enchanted. 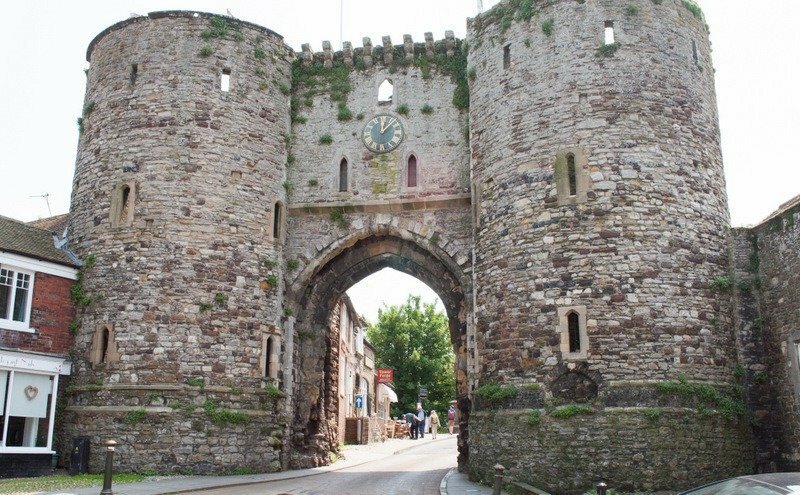 Start at Landgate and make your way Rye town centre and the High Street exploring the cobbled lanes leading off it. 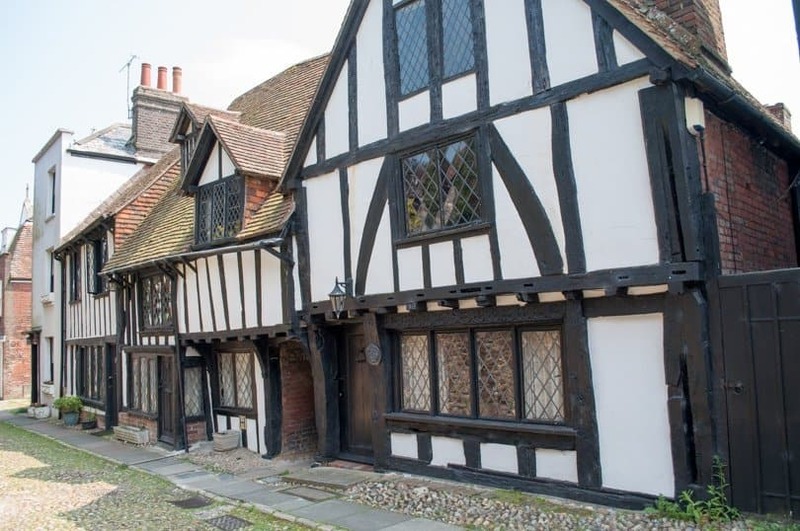 A weekend break in Rye should always include some ghost hunting so listen out for the ghostly footsteps of smugglers past running through the cobbled alleyways. Today Rye sits two miles away from the coast, however, before the river silted up the town used to be right on the shoreline and was a prime spot for smuggling. You can see a smuggler’s signalling lamp on display at Ypres Tower home to Rye Castle Museum. 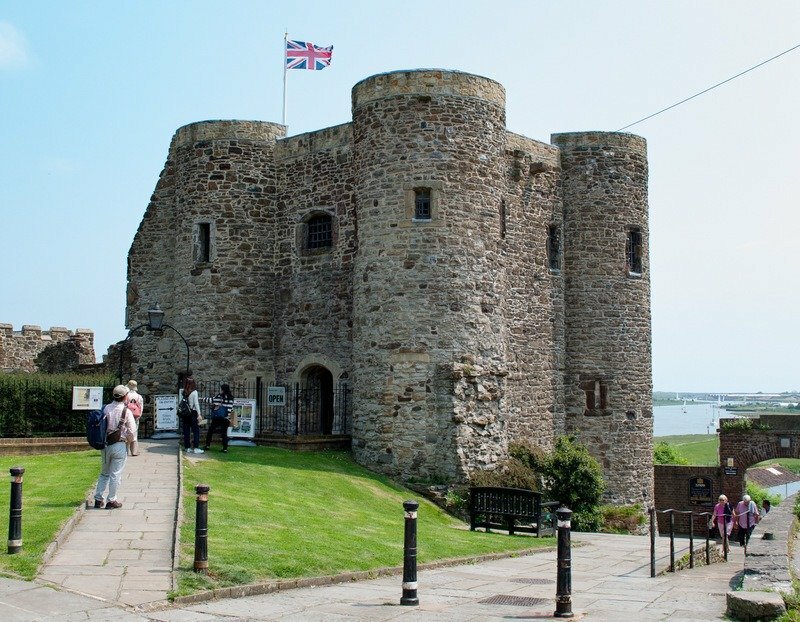 The tower, which is known as Wipers tower to locals, is also worth a climb to take in the views over the town and out to the estuary of the river Rother. A visit to Rye wouldn’t be complete without some shopping. Check out the quaint shops in and around the High Street. Four Doors (East Street) is great for bits and pieces you don’t really need but can’t leave without buying. The Shop Next Door (to The George in The High Street) stocks gorgeous home ware and gifts. Next head down to Strand Quay where you can delve through the antique and up-cycled furniture shops. There’s always a gem to be found there. 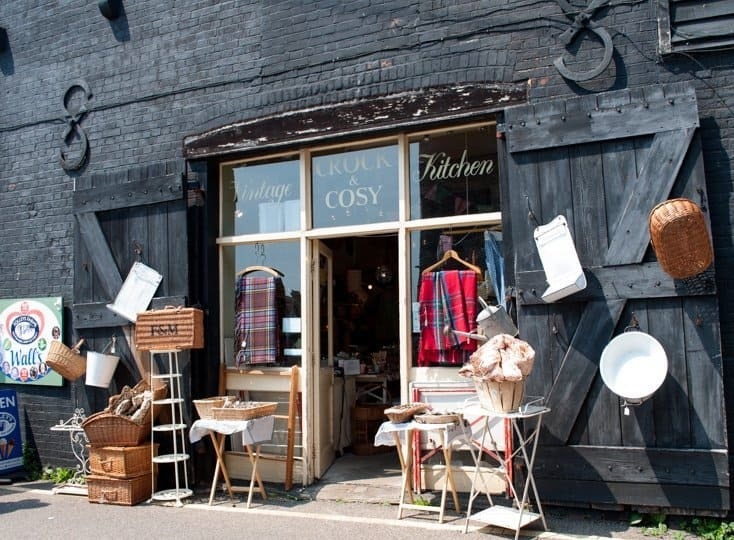 I love Crock and Cosy, a vintage kitchen shop, where you can find retro kitchenware – just like Grandma used to have. There’s a thriving art scene in Rye and you’ll find art galleries full of work by local artists. For a light bite the High Street is overflowing with quirky tea rooms and cafes; both The Fig and Edith’s House are worthy of a stop. If you’re looking for atmosphere then there are pubs with history stretching back hundreds of years. 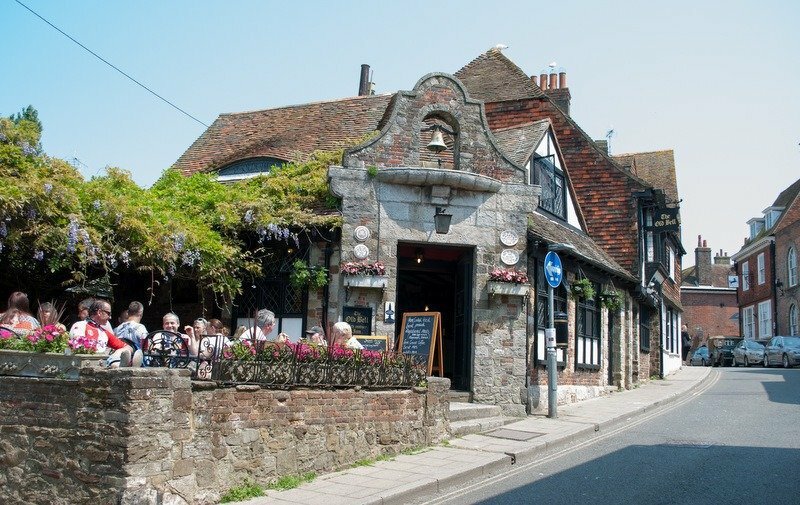 The Mermaid Inn, Rye and Ye Olde Bell Inn used to be connected by a secret passage used by smugglers. Not so secret is the great food they serve in beautiful ancient settings. Both pubs have pretty little gardens – perfect if the weather’s behaving itself. Knoop’s Cafe by Tower Forge serves up the best hot chocolate and milk shakes in the South. After lunch head over to Rye Harbour, which runs alongside the river Rother, to walk off your lunch. It’s one of my favourite things to do in Rye. If you’re lucky you might spot a seal. Drive or take the number 312 bus from Rye train station. 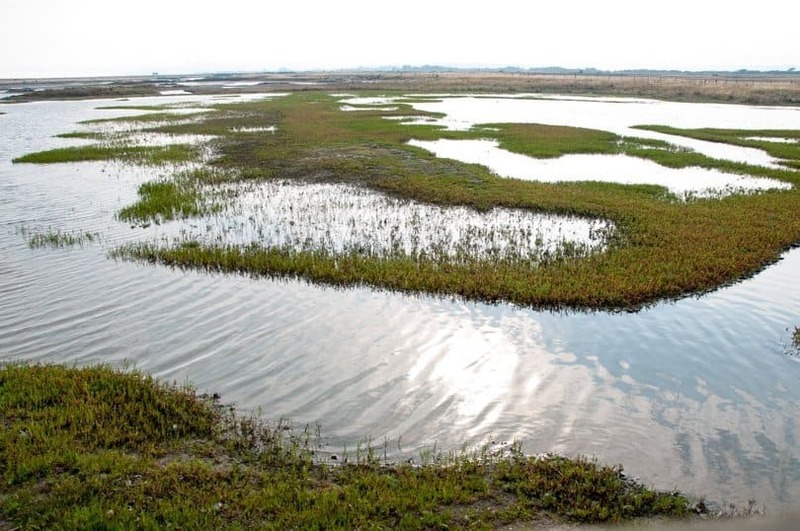 Rye Harbour Nature Reserve is just a few minutes walk from the harbour. So far over 280 species of bird have been recorded in the conservation area. A network of paths take you past freshwater gravel-pits, lagoons, areas of shingle and salt marsh habitat. 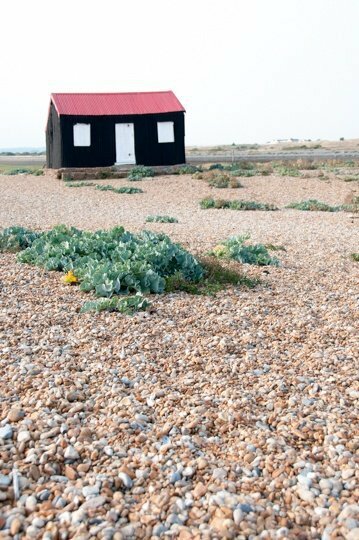 Hides are dotted around for wildlife watching or you can just enjoy the fresh sea air and the coastal flowers. Look out for ‘Little Red’ an iconic hut which has been on the site since 1904. There’s no shortage of restaurants in Rye but two of my personal favourites are The Devil in Rye where Dev Biswal serves up subtle Indian food with a British twist. Read my review here. For the freshest fish from the local fleet head for Webbe’s at The Fish Cafe. Rye must inspire creativity because it’s had many literary and artisitic connections. Visit Lamb House which was home to Henry James who wrote three of his novels whilst living in Rye. The Mapp and Lucia novels by E.F. Benson were based on the town and Lamb House, where he also lived, was the film location of ‘Malllards’, the home of Miss Mapp. Conrad Aitken and Radclyff Hall were both residents in Rye as was John Ryan who created the Captain Pugwash stories. Spike Milligan was another famous resident of the town. If you’re fond of sand dunes and salty air… Pack up a picnic (Simon the Pieman’s bakery in Lion Street might be able to help) and head to the beach. 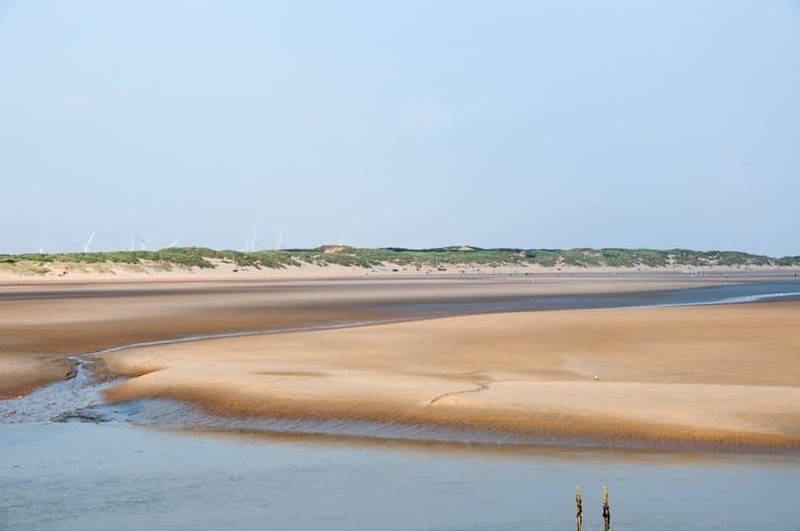 Camber Sands is a huge, glorious stretch of pale sand with a backdrop of massive dunes. Take buckets and spades for epic sandcastle-making opportunities or just chill out on the beach. The beach can be quite windy so take a wind break. Precautions should be taken when going into the sea as there are sandbanks under the water. A regular bus service from Rye to Camber Sands means you won’t need a car to get there from the town. If you’re looking for after-dinner entertainment Rye has it’s very own two-screen boutique cinema. Kino has state-of-the-art, digital high definition projectors and sound equipment. The larger of the two seats 96 and the other just 48. Kino is fully licensed which means you can enjoy your drink as you sink into your lovely armchair-style seat and immerse yourself in the latest blockbuster. Due to the bijou size you’ll need to book. There’s a cafe bar and outdoor terrace for pre and after-show drinks. 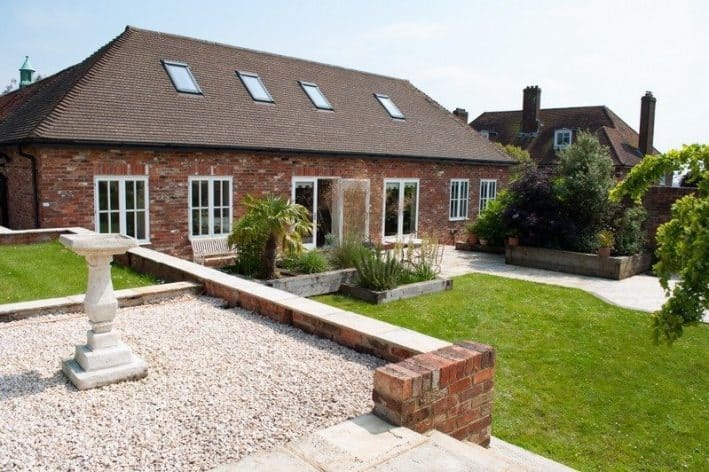 Cadborough Farm Cottages are a collection of six converted farm buildings and stables dating back to the late 1800s. Each brick-built holiday cottage and studio has been beautifully restored and sleeps two people and are perfect for a weekend break in Rye. Each one is unique and individual; Buttercup and Daisy are two studios in the old dairy, then there are three cottages; Brandy’s Cottage, Dairy Cottage and Stables Cottage. 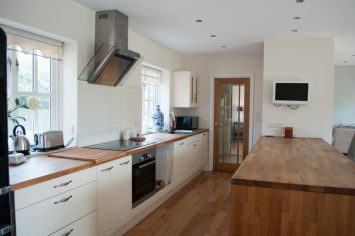 Each cottage comes with its own kitchen, en-suite bathroom, courtyard or garden, wifi and a TV/DVD player. 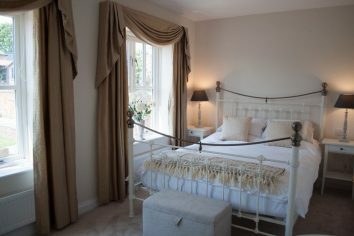 The Coach House is the most recent addition which has been renovated to a luxurious standard. The open-plan design is light and spacious with modern decor in calm muted colours. 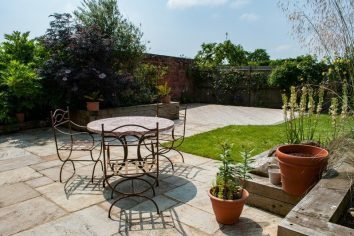 There’s a well-established garden with BBQ and sunbathing areas. 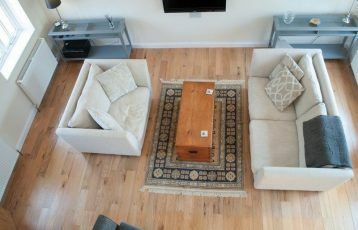 The cottages are all located in a quiet area with panoramic views towards the medieval town of Rye, the coast and Camber Castle. Rye town centre is around a fifteen minute walk from the farm following the 1066 bridle path or, alternatively, from the farm entrance by footpath. Rye train station is a 20-minute walk away or 5 minutes by taxi. 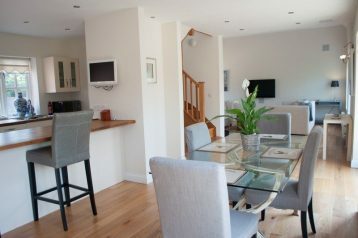 Prices start at £75 for the studios, £95 for the cottages and £120 for the Coach House with a three-day minimum stay. Children over 12 and small, well-behaved dogs are welcome. Call 01797 225 426 for further information and to check last minute availability for weekend or mid-week breaks in Rye. There’s always a reason to visit Rye and there’s always something going on. Tie in your visit with one of the town’s festivals which take place throughout the year. High-speed trains run from London to Ashford International with a journey time of 38 minutes. 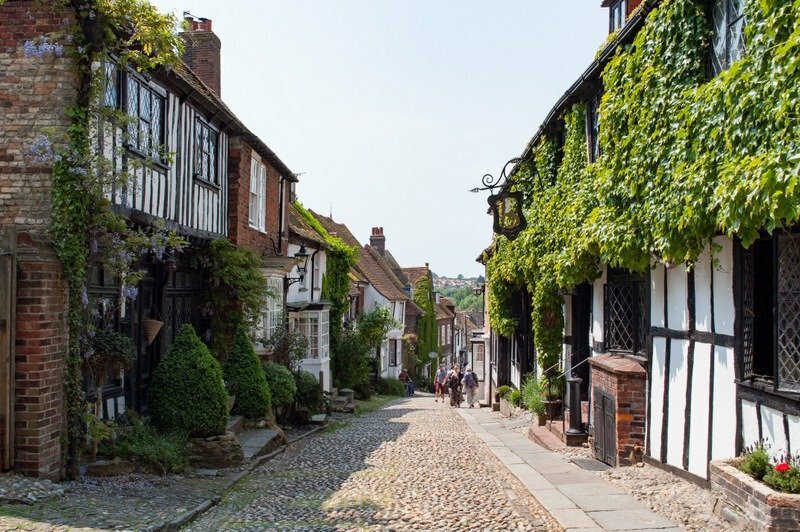 A further train to Rye takes 21 minutes which makes this pretty and historic town the perfect option for a day out from the city or a weekend break. Parking is known for being tricky in Rye, however, Station car park in the town centre is reasonably priced at £2.60 per day. This expires at 5am so you’ll need to pay for two days. 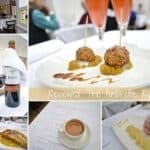 Have you been to Rye? What’s your top tip for visiting the town? This looks like a perfect small town for our upcoming trip. Do you have any idea if you can get from Rye to the White Cliffs of Dover easily? Hi, Rye is a lovely little town for a visit. Dover is about an hour’s drive away or you can take the train via Ashford International. If you’re look to visit white cliffs specifically then maybe think about Seven Sisters in East Sussex which are far more beautiful than those at Dover! This is exactly what I imagine England to be. Sure I want to see London- but this is what England really looks like in my mind! I hope we can visit here someday!!!! Stunning and picturesque place, Suzanne! 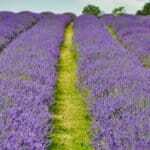 I would love to visit Sussex. 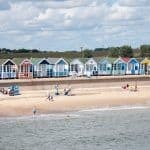 Hello, I would like to book one of the holiday cottages in Rye for a few days but am having difficulties connecting with them. I am calling from Canada. Would anybody have the right coordinates? Thank you. Looking forward to visiting Rye. Rye always looks so lovely but I still haven’t made it closer than Camber Sands despite not being that far away. More incentives to finally get there. Battle and Rye are easy to get to from London – you must visit! What a handy guide to Rye Suzanne! I went there just for a half day in the end last summer but my husband and I just fell in love with it and promised ourselves that when we go back, we’ll do a full day or even a night there and try out many of the tasty eating places there. The streets are so charming and quaint and we did make it to Ediths where I loved the scone menu! Sounds like I need to head to Knoops in the winter for a hot chocolate! I hope you do visit again – if you go for a weekend there’s so much else to do in the area. 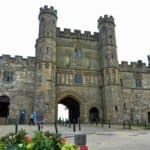 Bodiam Castle, Battle and Hastings Old Town are all less than half an hour’s drive from Rye and Winchelsea is another lovely village close by. Knoops hot choc is divine! Mrs Jones, superb post as always. Rye …. been there a couple of time over a day. Love the place and I remember the streets from you post and I have enjoyed lunches at the Bell. What I have missed out on is the sandy beach … never been down there. Just wonder why. What a picturesque town. I enjoy visiting Medieval villages and imagining what they must have been like years ago. Rye sounds like a great weekend getaway spot for sure. Rye will keep you busy for a day or two but there’s also so much nearby; wineries, castles, the seaside and lots more pretty little villages. Looks like a cute little town! I would love to visit more of the English country (I’ve only been to London and Cambridge). I just read a great book about Rye and Sussex – it seemed charming and your post confirms it! Ah you need to head south from London! What a coincidence that you’ve been reading about Rye and Sussex – what was the book called, I might have to check it out! This looks like the perfect weekend trip! We are going to London in March and want to do some exploring around the area, and I’m definitely adding this to my list. 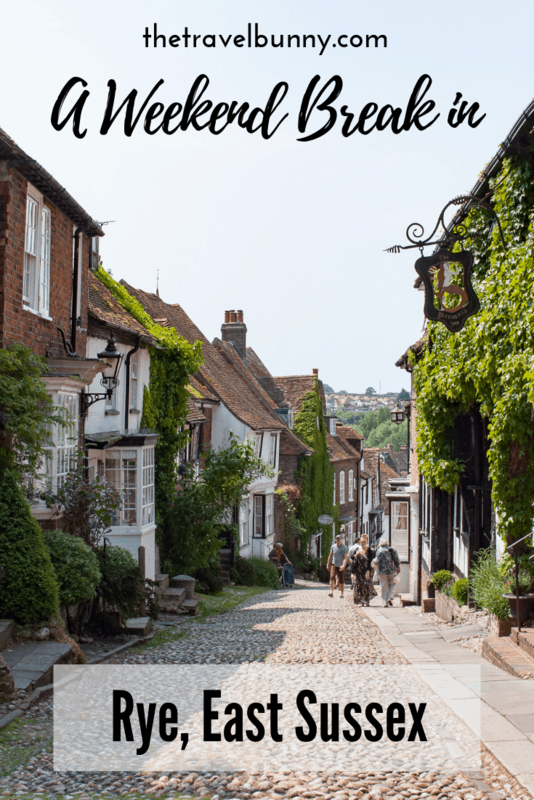 I hope you get the chance to visit Rye – it’s so quintessentially English! Such a cute town! I love all your posts!! I love English market towns! 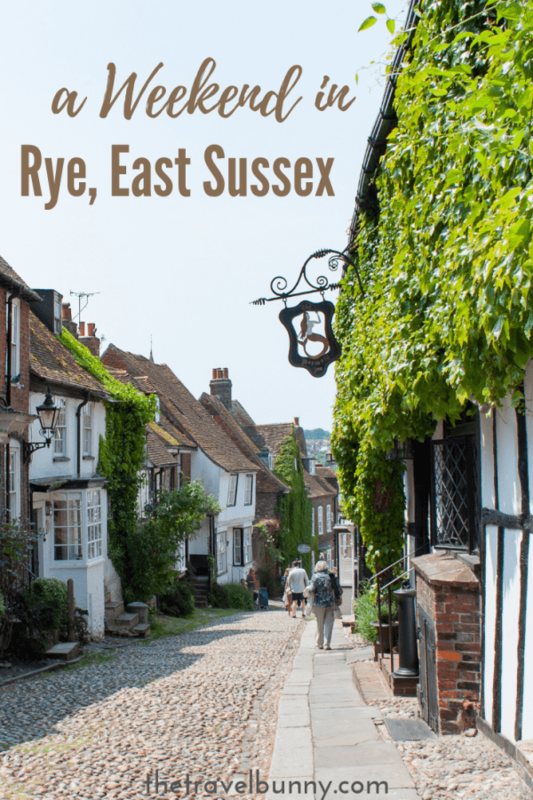 For many years, I went on road trips around the UK and this was exactly the kind of place I looked for: I missed Rye though and it looks gorgeous, i should definitely check it out next time. And best hot chocolate in the South? That’s all I need to plan a trip! This looks like such a great place to walk around and explore. I love visiting places that have a rich history. I always love a visit to Rye, in fact I might drop by this week!